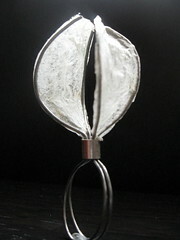 Su Trindle is a British designer and maker of sculptural modern silver and resin jewellery. My favourite place to be is my small workshop in my garden. I work alone, singing along to the radio striving to create beautiful well-designed, contemporary jewellery and make a living at it. This last is important, not just to my creativity and ego but to help feed by boys and the dog. Ring a Week is a development from the exciting explorations of Ring a Day last year. Hmm, you might have noticed, it's week 2 and already I am behind - what can I say? I like a deadline..
Last year I made rings with a lot of alternative materials and I think this year I will use this challenge to experiment, too. This is a Flickr badge showing items in a set called Resin & Silver. Make your own badge here.